There was something about that energetic dog in the second-to-last kennel at the shelter. Something special. “Boy, she was just on fire,” said Robert Oliver, corrections officer with the Escambia County Road Prison in Florida, of Britt, a shelter pup turned narcotics dog. In the fall of 2015, everyone could see that this large German Shepherd-mix named Britt harbored a ton of energy, but Robert saw that she also possessed an incredible toy drive and a willingness to work — all essential attributes for a canine narcotics officer. 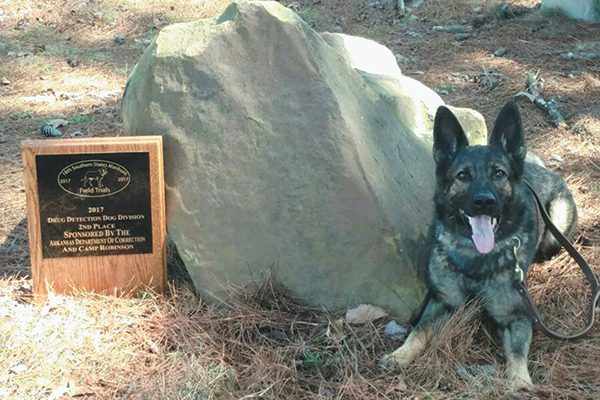 Britt went from shelter pup to award-winning narcotics dog. Photography courtesy Escambia County Road Prison. Who knew that a former stray who was adopted and then returned to the shelter because of her high energy could make an excellent dog in uniform? Robert did. “This dog has a great drive, and she’s infatuated looking for her ball or Kong,” he said. Officials at the road prison were looking for a canine to handle the contraband problem with the inmates who work outside the prison fence as well as to monitor any illegal substances that come inside the prison from visitors. “We needed an asset to work on that — and we found one,” Robert said. Since then, Britt has gone on to excel at narcotics detection. After completing a 200-hour course, she now goes to work daily with Robert and patrols the prison for drugs like heroin, methamphetamine, marijuana and cocaine. She’s so adept at her work, Robert is able to let her off leash to search given areas instead of leading her along. She finds it all on her own, he said. She’s that good. In fact, Britt recently sniffed out some marijuana hidden inside an emptied-out deodorant bottle, which was stashed at the back of an inmate’s crowded locker. Out of 170 bunks, she located the scent and honed in on the locker with the contraband. Another time, Britt zeroed in on 3 grams of methamphetamine hidden on a visitor to the prison, Robert said. This past March, Britt competed in the Southern States Manhunt Field Trials out in Little Rock, Arkansas. Up against specially bred, trained-from-birth narcotics dogs, Britt placed second. But why the shelter? Why didn’t Robert reach out to specialized breeders for a canine officer? Well, budgetary constraints were a factor, he said. But he also knew what diamonds in the rough could be found inside those kennels. He was in no hurry, which allowed him to wait until that one special homeless dog arrived. Although Britt is officially owned by the prison, she goes home every night with Robert and is a part of his family. She’s good with kids and loves to be the alpha to other dogs in the family. And she never fully rests. Robert said she constantly checks in with him as he sleeps to make sure all is well. Thumbnail: Photography courtesy Escambia County Road Prison. Kyra Kirkwood is a Southern California- based writer, author (Move Over, Rover!) and journalist. She lives with her husband, two kids, one rescue dog and three reptiles. Follow her at kyrakirkwood.com and on Twitter at @IAmTheWriteMom. The post How Britt Went From Shelter Pup to Award-Winning Narcotics Dog appeared first on Dogster.